We accept E-ZPass on our roads. CFX is the first and only toll operator in Florida to accept E-ZPass. You won’t incur any extra fees from us – just tolls. E-ZPass is a multi-state electronic toll pass that works in states from North Carolina to Maine and west to Illinois, and now in Florida only on Central Florida Expressway Authority’s roads in Metro Orlando. If your transponder is part of the E-ZPass Group (I-PASS, RiverLink Portable, NC Quick Pass Portable), your toll pass is accepted on CFX roadways. To learn more about the E-ZPass Group, visit www.e-zpassiag.com. PLEASE NOTE: If you have an E-ZPass and a Florida-based toll transponder, you only need to travel with your Florida-based transponder. If you have both an E-ZPass and a Florida-based transponder in your vehicle, you are at risk of being charged by both transponders. Where will my E-ZPass work in Florida? E-ZPass is only accepted on the Central Florida Expressway Authority’s 118-mile toll road network in Metro Orlando which includes downtown Orlando and surrounding communities. 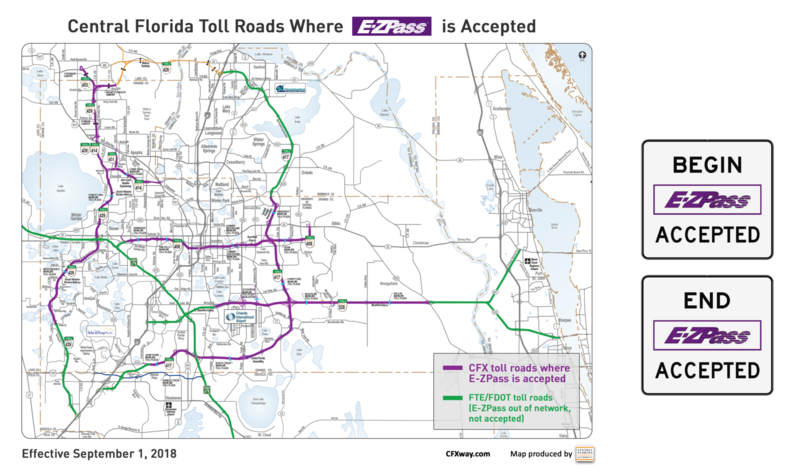 See roadway map ‘Central Florida Toll Roads Where E-ZPass is Accepted’. CFX is the only toll operator in Florida that accepts E-ZPass. E-ZPass users that travel out of network and are unable to pay with cash may receive Toll-By-Plate invoices from other Florida tolling agencies. What will I be charged for using my E-ZPass on Central Florida Expressway roadways? Your E-ZPass will be charged the same electronic toll rate as E-PASS customers are charged on Central Florida Expressway-owned roads. Click here to see toll rates. What happens if I drive on a Florida toll road that is out of network (not part of the E-ZPass network), such as those operated by the Florida Turnpike Enterprise/SunPass? If you drive to Florida in your own car and use toll roads that are out of the E-ZPass network, you may receive a Toll-By-Plate invoice from other Florida toll agencies if you do not have a Florida-accepted prepaid toll transponder. E-PASS now offers the E-PASS Xtra which combines the functionality of E-ZPass and E-PASS and is accepted in 18 states including throughout Florida. Click here for additional information. I have an E-PASS and an E-ZPass. Will I be double-charged or charged by both accounts for traveling on CFX toll roads? If you travel on CFX roads with E-PASS and E-ZPass, you could be charged by both accounts. For those customers with multiple transponders, it is recommended that you remove the E-ZPass transponder from your vehicle or place it into a Radio Frequency (RF) shield bag while driving throughout Florida in order to avoid the possibility of being charged by both transponders. You can also purchase an E-PASS Xtra which allows you to travel among 18 states including throughout Florida with one toll transponder and one toll account. Click here for more information. If you notice charges for the same date and time by both E-PASS and E-ZPass for driving on CFX roadways, please email your toll transaction statements from both agencies to e-pass@cfxway.com and we will review and assist you with the dispute. If you have any questions or concerns, you can call (800) 353-7277. E-PASS Service Center hours are 8AM-6PM (Monday – Friday). As a reminder, it’s important that both your E-PASS and E-ZPass accounts are current and up-to-date. Will my E-PASS work in E-ZPass states? No. But now the Central Florida Expressway Authority, in partnership with E-ZPass, has released a multi-state toll transponder called E-PASS Xtra that works everywhere E-ZPass and E-PASS are accepted. Click here for additional information. I have a SunPass and an E-ZPass. Will I be double-charged or charged by both accounts for traveling on CFX toll roads? If you are traveling on CFX roads with both SunPass and E-ZPass transponders, you are at risk for receiving charges on both prepaid toll accounts. For those customers with multiple transponders, it is recommended that you remove the E-ZPass transponder from your vehicle or place it into a Radio Frequency (RF) shield bag while driving throughout Florida in order to avoid the possibility of being charged more than once. If you notice charges for the same date and time by both SunPass and E-ZPass for driving on CFX roadways, please email your toll transaction statements from both agencies to e-pass@cfxway.com and we will review and assist you with the dispute. If you have any questions or concerns, you can call (800) 353-7277. E-PASS Service Center hours are 8AM-6PM (Monday – Friday). As a reminder, it’s important that both your SunPass and E-ZPass accounts are current and up-to-date. I have a LeeWay and an E-ZPass. Will I be double-charged or charged by both accounts for traveling on CFX toll roads? If you are traveling on CFX roads with both LeeWay and E-ZPass transponders, you are at risk for receiving charges on both prepaid toll accounts. For those customers with multiple transponders, it is recommended that you remove the E-ZPass transponder from your vehicle or place it into a Radio Frequency (RF) shield bag while driving throughout Florida in order to avoid the possibility of being charged more than once. If you notice charges for the same date and time by both LeeWay and E-ZPass for driving on CFX roadways, please email your toll transaction statements from both agencies to e-pass@cfxway.com and we will review and assist you with the dispute. If you have any questions or concerns, you can call (800) 353-7277. E-PASS Service Center hours are 8AM-6PM (Monday – Friday). As a reminder, it’s important that both your LeeWay and E-ZPass accounts are current and up-to-date. I believe I was double-charged for the same transaction on CFX roads. What is the process to receive a refund? If you notice charges for the same date and time on two different prepaid toll accounts for driving on CFX roadways, please email your toll transaction statements from both agencies to e-pass@cfxway.com and we will review and assist you with the dispute. If you have any questions or concerns, you can call (800) 353-7277. E-PASS Service Center hours are 8AM-6PM (Monday – Friday). If I have an E-ZPass transponder and an E-PASS or other Florida-based transponder, can I combine them into one single account? Yes, now you can purchase the new E-PASS Xtra transponder which will allow you to add nonstop toll travel on all toll roads in Florida and Georgia and wherever E-ZPass is accepted. After opening an E-PASS Xtra account, contact your E-ZPass network agency to let them know you want to close your account. When will E-ZPass be accepted at other Florida toll facilities? There are ongoing discussions with other Florida toll agencies. E-ZPass continues to work with other toll agencies and regions to establish national interoperability of tolling systems and will provide more details as they are available. You can learn more by visiting www.e-zpassiag.com.